Major news Seattle MKG, TBA, Muay Thai and MMA community! Grandmaster Chai is returning to Seattle, WA for the first time in 5 years! Come learn from the Godfather of Muay Thai in the USA. 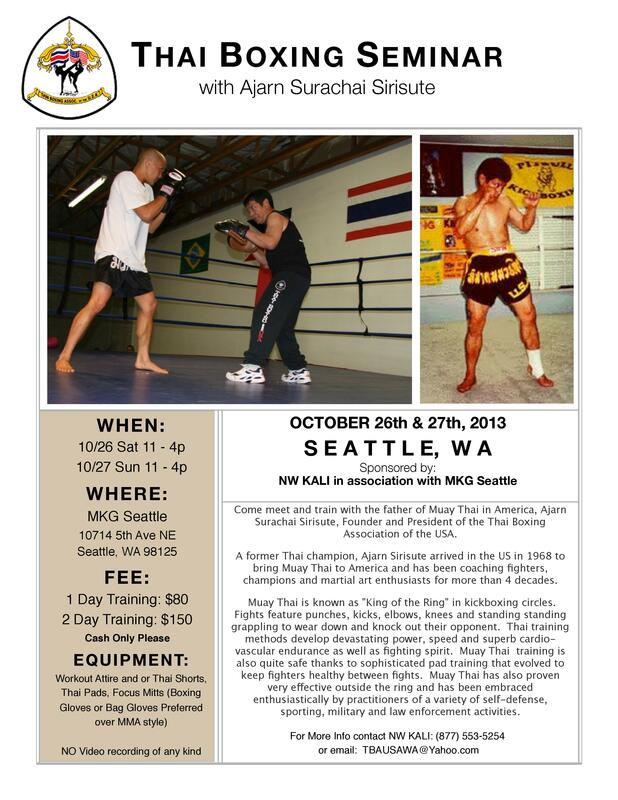 NW Kali/Ajarn Chris Clarke in association with MKG Seattle is proud to host a weekend seminar with Ajarn Chai Sirisute this October 26th and 27th, 2013. For more information on the Muay Thai Classes at MKG visit our Thaiboxing page here or click on the Get Started button below to request information. At the age of six he had also acquired the reputation of a hell-raiser and would taunt the boys in a neighborhood Karate school taught by a Chinese man, Master Chen, who was to become his first teacher. The young Sirisute had no use for the uniforms, lines and stances of Karate and proclaimed loudly that he could best any kid in the school. Master Chen agreed to set up a sparring match and soon realized that this precocious six year old was mopping the floor with his 8 and 10 year old students. But Master Chen was determined to teach the boy a lesson in discipline, so Chen gave a mind-over-matter demonstration that amazed and frightened the young boy. Sirisute recalled, “I couldn’t believe it. I got so scared. After that I just shut up and got into line and started throwing punches with the rest of them.” Perhaps it was in Master Chen’s class that Sirisute first learned the value of his now familiar mantra of ‘discipline and respect’. Sirisute’s Muay Thai teacher, Ajarn Suwong, made a lasting impression on him. Ajarn Suwong had had a prophetic dream, and stated flatly when he met the six year old Sirisute, “This is the champion that will spread Muay Thai to the falang [to the foreign lands].” Whether that was Sirisute’s fate or an internalized message from a cherished mentor, that mission became Sirisute’s life’s work. It remains one which he has pursued with an almost spiritual zeal. 1983 picture of Ajarn Chai (left) and Terry Tippie in the backyard of his Pomona,California house. Despite the grace of the motion Ajarn Chai’s kick has a bone jarring, jackhammer-like power derived from the incredible speed of his kick. During the 1970s and early 1980s Ajarn Chai taught at several Southern California colleges: Chaffey College, Claremont Men’s College and Cal. State San Bernardino. Also during those years Ajarn Chai trained students at his home, the backyard of which was converted into a Thai-style camp. Many of Ajarn Chai’s early fighters, such as Mike Goldbach, Reggie Jackson, Glen Hernandez and Don Boyd, came out of a backyard training environment. It was this core of fighters who Ajarn Chai lead to Thailand in 1982 to enter the first American team to compete in the Muay Thai World Championships. Sirisute also fought battles with the martial arts establishment over fighting procedure, specifically the Wai Kru [“respects to the teacher” dance before a fight], uniform and use of knees & elbows. “They told me that my fighters couldn’t wear the short pants to fight but had to wear a Gi,” growled Sirisute. Shaking his head, quot;They used to laugh and ridicule Thai Boxing [fighters] when they would do the Wai Kru. But they don’t laugh any more because we always knock ’em out.” Thanks in part to the early efforts of Sirisute Muay Thai fighters no longer have to struggle against this kind of indifference. Teaching in the 1990s. Ajarn Chai shows an inside scoop defense against TBA Instructor Doug Pandorf’s foot jab. In 1978, Sirisute met a young Filipino-American high school teacher named Dan Inosanto. Inosanto trained as a student in Ajarn Chai’s backyard during these years and they soon became close friends. Once Ajarn Chai gave Inosanto the task of kicking the leaves on a tree, then forgot about him and went shopping, leaving Inosanto to swelter in the LA summer heat. When Ajarn Chai returned several hours later Inosanto was so exhausted and dehydrated that he could barely stand up. But he still had his hands up and was still kicking. Sirisute exclaimed, “Oh my God…I forgot all about you,” and held his sides and let out a piercing falsetto cackle. Actually Sirisute had not forgotten about Inosanto but was testing Inosanto to see whether he would keep going and whether he would come back. Inosanto did come back, and the friendship that grew up between these two men in those years has served both well over the years. Already well known in the U.S. Inosanto introduced Sirisute to teaching seminars, which greatly helped Ajarn Chai extended awareness of Muay Thai in the U.S.A. as well as internationally. By the early 1980s word of Muay Thai was spreading fast in the martial arts community. In 1983 Inosanto introduced Sirisute to Tom Landry of the Dallas Cowboys. The diminutive 5’5″ Sirisute was undaunted when greeted with skepticism by the players. “I just pointed at him [Tony Dorsett] and told him to hold the pad for me,” explained Sirisute. Taken aback at the jackhammer like impact of Sirisute’s right leg on the Thai pad, Dorsett exclaimed, “This guy isn’t human!” The Dallas Cowboys were soon throwing Thai kicks and skip knees, and the Cowboy’s incorporated Ajarn Chai and Muay Thai into their pre-season conditioning until the time of Landry’s departure in 1990. In fact, all-pro defensive end Randy White is reputed to have developed the hardest Thai kick ever recorded–a stunning 450 lbs. per square inch. Ajarn Chai loves to fish. 1988 salmon fishing trip in Puget Sound.